Pope Benedict XVI on 9 May 2007 begins his first visit as pontiff to the western hemisphere and, in particular, to the world's largest Catholic nation: Brazil. There are plenty of reasons to see the six-day trip as a historic test for the Vatican, for the Brazilian Catholic church, and for Benedict XVI himself. In the two years of his pontificate, neither Brazilians nor Latin Americans have so far appeared at the centre of his attention, despite the fact that 500 million Catholics live here. The neglect is astounding, and reinforces the sense that the visit will be for the pope a trial by fire. Benedict XVI will encounter a religious landscape very different from the one that confronted his predecessor, Pope John Paul II, in his two visits to Brazil (in 1980 and 1991). Brazil is still the world's biggest Catholic country, but it is also experiencing the rapid growth of both Pentecostalism and secularism. It is not surprising, then, that the influence of secular values and the dramatic rise of Pentecostal "sects" will be high on the agenda of the fifth general conference of the Latin American and Caribbean bishops (Celam, 13-31 May 2007) at the small city of Aparecida, near São Paulo. Benedict XVI is expected to attract more than a million people to two open-air masses during a journey that is confined to São Paulo, Brazil's wealthiest and most populous state and the headquarters of one of the world's largest Roman Catholic dioceses. The pope will address more than 30,000 Catholics in Pacaembu soccer stadium on 10 May; celebrate mass before a huge crowd at São Paulo's Campo de Marte airport on 11 May (where he will also canonise the first Brazilian-born saint, Antonio Galvão, known as Frei Galvão); and conduct a second open-air mass in front of at least 350,000 people at Aparecida on 13 May. Behind the great numbers lie important matters of theological and even political substance. John Paul II's first visit to Brazil in 1980 (which lasted for two weeks) derived some its character from its implicit contest with the country's authoritarian military regime, and with others across the continent. The Brazil and the Latin America that Benedict XVI is visiting in 2007 have undergone great political, religious and economic changes in this generation, which have had the accumulative effect of weakening the church's once unquestioned dominance. This time, the challenges of the pope's visit are as much to the church itself. "Brazil, the United States and ethanol"
The growth in Pentecostal ranks is attracting high-level attention not only from Catholic officials but from politicians. In the presidential election in Brazil in November 2006, for instance, the incumbent Luiz Inácio Lula da Silva strongly courted the Pentecostal vote. In the last Brazilian congress, some 10% of the 600 congressmen were evangelicals, mostly Pentecostals. This pattern of increased political participation is one that is being repeated throughout Latin America. In this dynamic context, the challenge facing by Pope Benedict XVI and the Latin American bishops is to ensure that the Catholic church remains a vital part of the Brazilian social and political scene. It is necessary to the integrity of the Catholic claim - shared by Vatican, bishops and many of the faithful - to remain an integral part of Brazilian society. But is it possible to sustain the claim? In Europe, a majority of former Catholics have simply become secular; in Brazil, this trend is occurring too, but it takes place alongside a turn towards Pentecostalism. In 1980, when 1.5 million people greeted Pope John Paul II in São Paulo, the overwhelming number of Brazilians (89%) still self-identified as Catholic. By 2000, the Catholic share of the population had dropped to 74%. A survey by the Pew Forum on Religion & Public Life released in October 2006 confirms the Catholic decline and Protestant (more specifically Pentecostal) growth. Less than 60% of the urban population now claims a Catholic affiliation. At the same time, there was a rise in the number of people with no religion, from 1.6% in 1980 to 7.4% at the time of the national census in 2000. Above all, the number of Pentecostalist Protestants has increased from 5% in 1980 to 15% in 2000, and above 20% in urban areas. 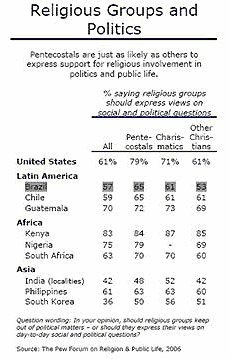 On 7 May 2007, the newspaper Folha de Sao Paulo published the results of a survey by the research organisation Datafolha that confirms this portrait of a more competitive and fractious religious environment. Amid an overall finding that 97% of Brazilian people believe in God, the survey reports that in 2007, 64% of Brazilian people self-identify as Catholic; in 1996 the figure was 74%. During this period, the proportion adhering to Pentecostal churches has increased from 11% to 17%. The spirit of Pentecostalism is also drawing a growing number of followers among Catholics who are remaining members of their church (see Box 1). Pentecostal beliefs and practices are also changing the way many of Brazil's remaining Catholics practise their faith. "Pentecostalism no longer is something confined outside the Roman Catholic church", writes Luis E Lugo, director of the Pew Forum on Religion & Public Life. "It is now firmly within the form of various charismatic tendencies and movements". There are two clear examples to illustrate this point. The first is that the Vatican has resurrected what the second Vatican council had buried: the Latin mass. Frei Betto, a Brazilian Dominican with an international reputation as a liberation theologian, questions the return of Latin on the grounds of comprehension. "Nowadays the great majority of Catholic faithful are concentrated in Latin America", writes Frei Betto. "They do not understand Greek, Latin or English. Would it not be better for them to celebrate the mass in the vernacular?" The church's efforts towards enculturation in other spheres make it something of a contradiction to return to the Latin mass. The second example is the Vatican's affirmation that getting married for the second time is a "scandal" and that Catholics who do remarry are not allowed to receive communion. Many of the faithful feel uncomfortable with Pope Benedict XVI's statements on this issue. The gospels reveal that Jesus communed with persons who, seen through today's eyes, acted in ways far from contemporary Vatican morals. He defended adulterous women who were about to be stoned by the moralists of that age, and practised goodness without making any distinctions. If so many faithful are going to the Pentecostal communities - a phenomenon also found on a wide scale in Africa, Asia, and north America - it is because they are thirsty for a living, real Jesus whom the church proclaims too feebly. This is the humanised and politicised Jesus found in the work of Jon Sobrino, the liberation theologian condemned in March 2007 by the Congregation for the Doctrine of the Faith on the grounds that two of his books "may cause harm to the faithful". A Spanish priest who has spent his life working with poor people in El Salvador, Father Sobrino narrowly escaped death in 1989 when six of his confrères were murdered by Salvadoran death-squads. Such experiences helped enrich the priest's theology, which focuses on the poor as the primary recipients of Christ's message. Despite this personal story, Benedict XVI sanctioned the rebuke of Father Sobrino, whom the Vatican, with minimal explanation, accused of not sufficiently emphasising the divinity of Jesus. For Benedict XVI and Latin American bishops, for right and left Catholics, for officials of the Vatican and of Church base communities, Jesus is decidedly the central issue. The Vatican and its clerical establishment adheres to the liberal Platonism (via St Augustine) that opposes the divinity and humanity of Christ. The church in the region and its local communities ratifies this nearness, in the spirit of the apostle Paul: divinity is the plenitude of humanity, and humanity is the harbinger of plenitude. There is more. Changes in the role of women in the church, teachings on sexual behaviour, or flexibility over abortion are out of the question for Benedict XVI. He has reinforced the primacy of the pope - an issue his predecessor had opened for debate. He has tried to tone down the emphasis on the person of the pope, a motif of John Paul II's style, and return it to the basics of the faith. Above all, in his pronouncements and writings, Benedict XVI has carefully accentuated the positives aspects of faith. His first encyclical, released on 25 December 2005, was titled "God Is Love", and announced: "Christianity, Catholicism, is not a collection of prohibitions: it is a positive option". For officials of Vatican and for the faithful alike, making words and acts consistent is a difficult task. The issues surrounding Pope Benedict XVI's visit to Brazil provoke doubt whether the pontiff will truly be able to speak to Latin America, and to touch its heart.